Vibrancy is often talked about in urban planning and development discussions. It is sometimes described as a desirable quality that has waned and is in need of restoration. Other times, it is castigated as being too closely associated with upper middle class urban elites’ consumptive appetite for inner city lifestyles. As three sound scholars who are not urban planners, these discussions lead us to wonder if there are distinctive sonic qualities of what is perceived as “vibrant.” If so, what are they? To explore this question, the three of us, a sound ethnographer, acoustic ecologist and a composer/music technologist, have formed LA Listens. In addition to this question of vibrancy, we’ve come together over a shared interest in urban sounds and Los Angeles. Coming from distinct disciplinary interests, we each have particular questions that we are interested in. Jessica is curious about how the characteristics of the urban soundscape in Los Angeles affect the way we interact with our environment and each other. Steven is interested in understanding the sonic qualities of urban sounds while exploring the musical qualities of places. For example, he is exploring the idea that repeating events can be seen as rhythm on a macro-level time scale. Finally, Wendy has questions about how people make sense of urban sounds culturally and socially, particularly in light of the politics related to urban development and placemaking. While our questions diverge in terms of perspective, a cross cutting underlying interest for all of us is the effects of urban sounds on people. To that end, LA Listens takes an experimental analytic approach to listen to the interrelationships between the sensory, social, and ecological aspects of streets in Los Angeles. Sounds permeate through spaces in the form of layers. Through this structure, sounds form the identity and construct the experience of a place. Through engaging with the experiential and data dimensions of place-based sensory traits we can analyze the permeable layers of LA’s public acoustic territory (Atkinsons 2007; LaBelle 2010). Our research goals extend into the civic and creative realms. We intend to offer sensory data as resources for city planners and community organizers to draw upon when engaging in policy and other conversations. We also want to spark a creative dialogue, providing artists with access to our data to co-produce reflexive interpretations of the city’s sounds. As sound scholars, we agreed that location recordings offer a nuanced and sense-based understanding of the human experience of place and space. To brainstorm locations in Los Angeles in which to scrutinize the meanings of “vibrancy”, we came up with a two-pronged approach touching on both data and policy related to environmental sounds in Los Angeles. First, we looked for relevant data published through the City’s portal. Curious about the role of vehicular sounds in the urban landscape, we mapped the city’s collision data from this year in order to identify busy and dangerous street intersections. Additionally, we wanted our project to speak to the city’s current urban development programming and policy, so we selected street intersections within the corridors that have been chosen as a part of the LA Mayor’s Great Streets program. We then walked around these street corridors and intersections, listening closely to and taking note of the sonic and social properties of the changing sound environment. This ambulatory listening practice is typically referred to as a sound walk (Tausig 2011). After we identified a single spot, rich in layers of static and dynamic sounds generated by a constellation of natural, human-made, and machine-made sources, we set up our recording gear. 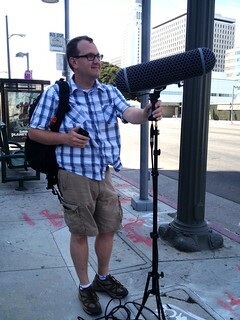 We stood at intersections in Highland Park and Boyle Heights and captured 10-20 minute neighborhood-level field recordings. We also recorded a busy intersection in Little Tokyo in downtown Los Angeles. We intend for this project to reject the siloed disciplinary approaches to researching sound by experimenting with research modalities and tools from sound-specific disciplines across the humanities, sciences, and the arts. In doing so, we hope to offer urban planners fodder for integrating sound into their planning processes. In approaching this work from different disciplines, we have also learned the value of a collaborative design process and the value of establishing a complex research methodology through negotiation. 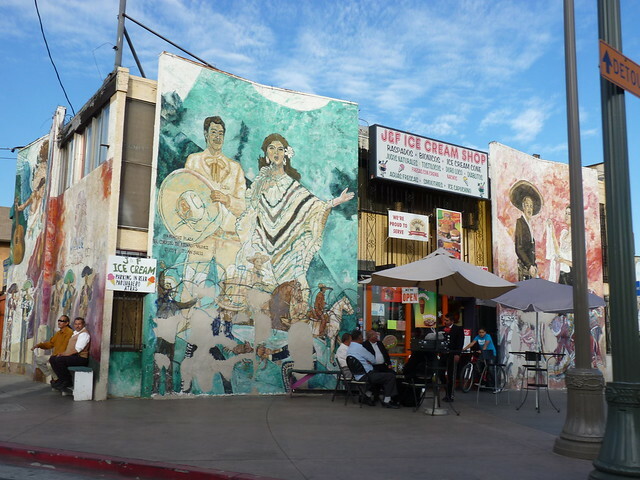 In our next blog post, we will delve into how we analyze our location recordings through sharing some of our individual and collective thoughts on our preliminary findings from the East Los Angeles neighborhood of Boyle Heights. Stay tuned! Atkinson, Rowland. 2007. “Ecology of Sound: The Sonic Order of Urban Spaces,” Urban Studies, Vol. 44, No. 10: 1905. DOI: 10.1080/00420980701471901. LaBelle, Brandon. 2010. Acoustic Territories: Sound Culture and Everyday Life. New York: Continuum. Tausig, Benjamin. 2011. “Creative Reception in Urban Space, or the Art of Listening,” Journal of Urban Culture Research, Vol 2. Post by Wendy Hsu, Steven Kemper, and Jessica Blickley. Wouldn’t have thought anyone thinks about how cities sound, except when building theaters and operas. However, I think most “indigenous” city-dwellers largely ignore these sound-scapes just as people living close to a railway line eventually tend to completely overhear and forget these sounds that would rob overnight guest of their sleep (not that it wouldn’t, even if getting accustomed to it, increase blood pressure and heart failure rates etc.). Rather I think that it is the newcomers and the tourists who would notice if a particular city’s sounds sounded characteristic and/or unfamiliar. And it would be interesting to see (! – hear) if strangers would be attracted to a particular environment more by the characteristic venues such as museums, monuments etc. or (also) by the sound “fingerprint” of a certain city. I could, for example, imagine that Venice, with its many canals, would have a characteristic backdrop of sounds that fwew other cities could ever match.